Join us for The Roxy’s most popular cinematic experience - Heels & Reels! An occasion night out showcasing a film with a fierce heroine(s) that’s making ladies and lads alike, proud! Heels & Reels gives a chance to celebrate those powerful heroines on screen. This October, get ready for a romantic musical roller-coaster with A Star Is Born, starring Bradley Cooper & Lady Gaga! 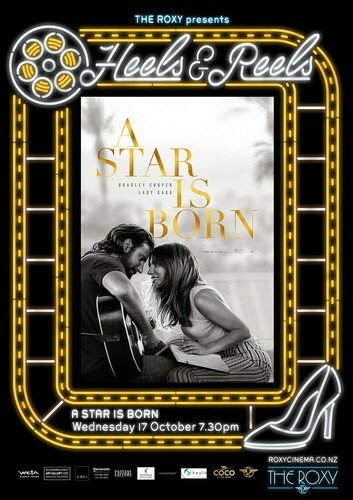 Jackson Maine (Bradley Cooper) discovers—and falls in love with—struggling artist Ally (Lady Gaga), who has just about given up on her dream to make it big as a singer… until Jack coaxes her into the spotlight. Your ticket price includes a shindig in our Grand Lobby before the screening, where you will receive a welcoming drink, a selection of canapés to tantalise your taste buds from CoCo, and some amazing treats from our wonderful sponsors at Haylo Skin & Body, La'ffare, Weta Workshop, Whirlwind Designs, Blackmore & Best, Harcourts, Caci Clinic and Headstart. And that’s not even the best part… it’s only $30 a ticket! Whether you're a foodie, a moviegoer or simply in need of a fun night out with your pals or partner, then this is the night for you. So grab your crew and get ready for a night to remember!